Good Morning! Ughhh the past two weeks have been a whirlwind for this family, and I apologize for not posting some delicious recipes. We have had two major home issues resulting in two insurance claims, and home relocating over the last week plus a wedding! Never in my life have I been so grateful for amazing homeowner policies, working fire alarms and amazing friends, family and co-workers. If you haven’t done so lately make sure you check your batteries in your smoke alarms you never know they might just save your life! Pre-heat the oven to 375* and spray a cookie sheet with non-stick spray. Take your crescent roll dough or your puff pastry and making it flat. (some stores sell crescent roll sheets which are handy). 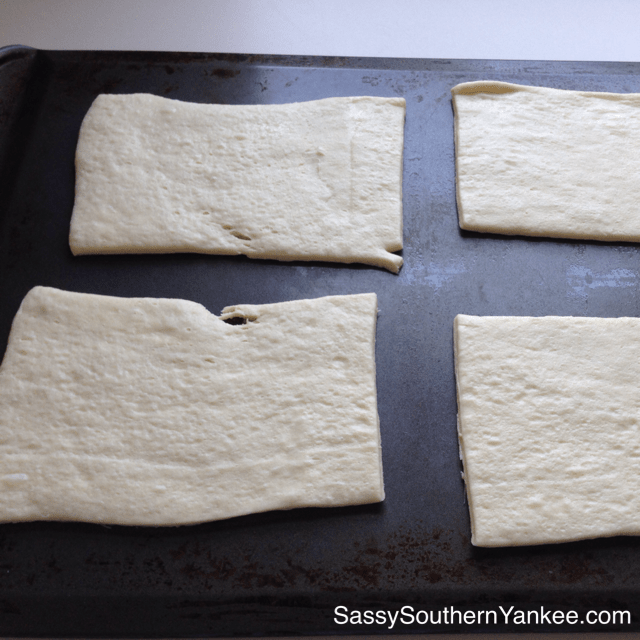 After you have the dough rolled out cut the sheet into four squares. 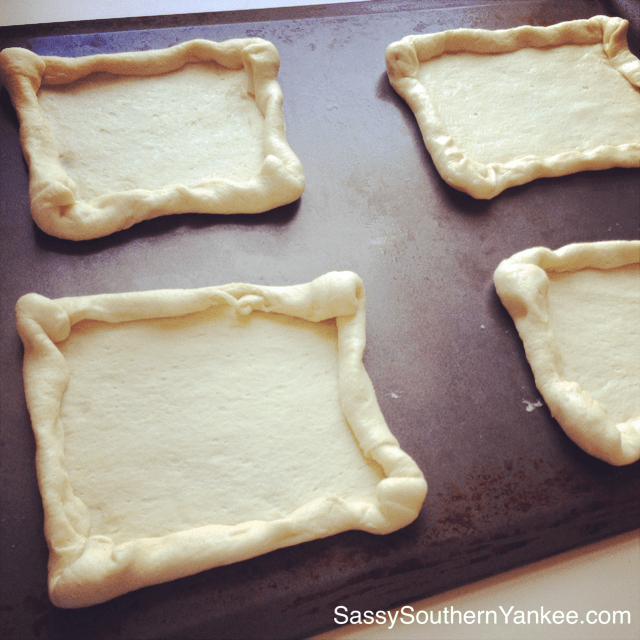 Place each square onto the cookie sheet. Now we are going to build our “walls” to help hold in the eggy goodness. Take the outside edges of the dough and roll them slightly inward creating a small wall. This will help keep the egg whites in the pastry when we crack the eggs. If desired sprinkle the edges with the garlic powder for an additional layer of flavor. Next wash the asparagus. 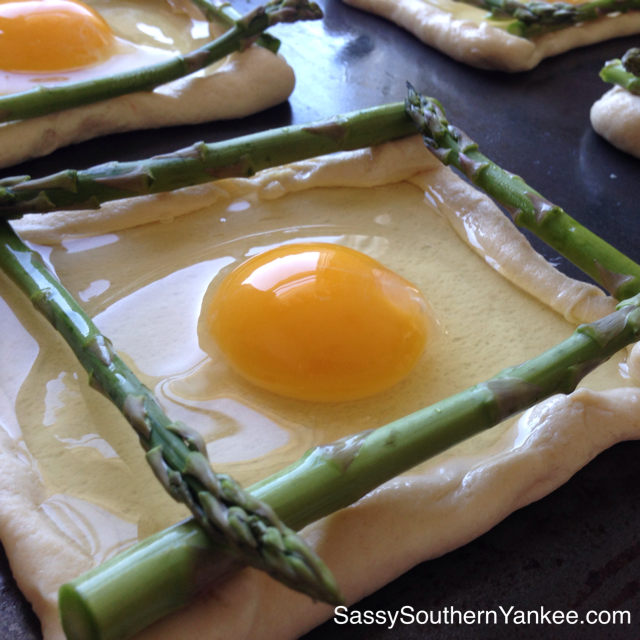 Cut the ends off of the asparagus to fit the dough squares. Place 4 pieces of asparagus on each of the tart square edges. I like to overlap each one to make it look pretty, but really you can do whatever you want here. Next crack each egg over the individual tarts. Bake the tarts in the oven for 15 min until the egg white is almost set. Then sprinkle with the fresh parmesan cheese, and place back in the oven for about 5 min until the cheese is melted and the egg white is cooked but the yolk is slightly soft. Salt and pepper if desired and serve immediately. 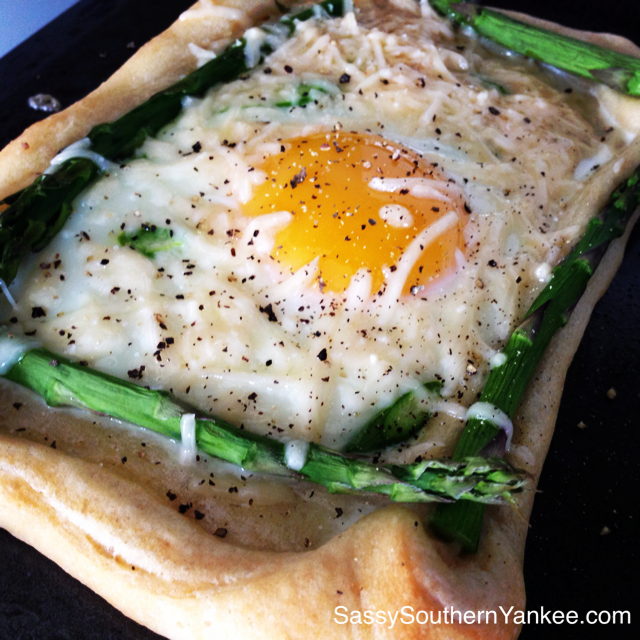 I hope your family loves these Asparagus and Egg Tart as much as we did! These Asparagus and Egg Tarts are simple and elegant enough for a brunch, but hearty enough to feed even the hungriest helpers. Place each square onto the cookie sheet. Now we are going to build our "walls" to help hold in the eggy goodness. Take the outside edges of the dough and roll them slightly inward creating a small wall. This will help keep the egg whites in the pastry when we crack the eggs. If desired sprinkle the edges with the garlic powder for an additional layer of flavor. Next crack each egg over the individual tarts. Bake the tarts in the oven for 15 min until the egg white is almost set. Then sprinkle with the fresh parmesan cheese and place back in the oven for about 5 min until the cheese is melted and the egg white is cooked but the yolk is slightly soft. Salt and pepper if desired and serve immediately. I hope your family loves these Asparagus and Egg Tart as much as we did! 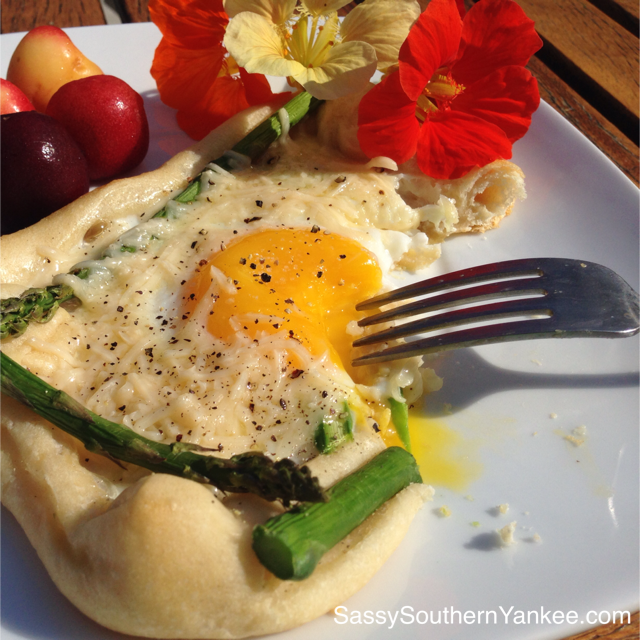 This entry was posted in Breakfast and tagged Asparagus, crescent roll dough, Egg, Garlic, parmesan cheese.